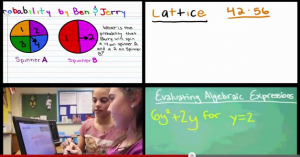 Move Over, Sal Khan: Sixth-Graders Create Their Own Math Videos! Eric Marcos is a sixth-grade math teacher at Lincoln Middle School in Santa Monica, California. But his kids stay after school, spend hours on their homework, and accompany him to education conferences (and even sometimes lead his presentations). None of Marcos' students are doing this for extra credit. They're simply learning a lot about math and they're loving it. His secret? The now-global phenomenon known as MathTrain.TV: kids teaching other kids through creating their own video tutorials. Much like the now-famous Khan Academy -- but it's made by and for students. It wasn't Marcos' idea in the beginning. "Believe me, I'd love to take credit," he laughs. The breakthrough happened when, about five years ago, one of his students used their class Moodle to send him a question about a homework problem. "If you try to answer a math question in an email or a Word document, though," says Marcos, "it's crazy hard to line things up, even a couple of equations." "If you give kids a little bit of trust and let them try out some stuff, they're going to come up with fascinating things that will surprise you." So he turned on his newly-acquired classroom tablet PC, scribbled a few equations, pushed record, and made a screencasting video. "This was at about 7 at night. The kid sent another message right away, saying, 'Thank you! I got it now. Can you make me another one for this problem?'" Over the next few days, other students wanted to know why they didn't get a video, asking him to post it somewhere so they could all benefit. Then one of Marcos' students asked if she could make a video, too. "It was unbelievable," he says. "I didn't give her any direction – well, because I couldn't, I didn't even really know what I was doing. But she made a little video about proportions that had a beginning, a middle, and an end, just like an English paper or a presentation." Soon enough, students weren't staying after school just to doodle on Marcos' tablet PC – they stayed to make math videos. Marcos decided to house their growing archive of tutorials on a website using PHPMotion.com, a free YouTube clone software (YouTube is blocked in most schools). Now, in addition to a website, the class has a podcast and an app on iTunes for the iPhone and iPad so that people can share MathTrain videos on Twitter and Facebook. "Better than that we have an app, though," says Marcos, "is that it's made by a student." Once in a while Marcos will make a video or two, but the vast majority of MathTrain.TV is populated by student-authored tutorials. "It's much better to have the students' voices. It's hard to hold off sometimes, but I made that choice." Clearly, says Marcos, "It's fun for them. They like being behind a microphone, putting a star next to something. They put their heart and soul into it." Because they're making a video, "They'll spend over an hour on one math problem: 'Let's put this in blue. Now I'm going to try to put some pop-ups next to it.' Instead of listening to the teacher, they're taking an active role in their own learning." And so often, he says, "the best way to learn something is to teach it. I've heard kids say that when they were trying to explain how to divide fractions, they knew to flip the number over but they didn't know why." Because they were creating a tutorial video, "They found out that they didn't know why" – and then, naturally, they found out why. The MathTrain word is spreading now, from Marcos' own presentations at gatherings like the ISTE conference to those of ed-tech leader Alan November. "The global audience thing is amazing," Marcos says. "We have contacts from literally all over the world. And we weren't doing this for the world at the time!" In the beginning, students "were just doing it to help their friends. They weren't necessarily looking to help people out in Australia, but now they are." For those interested in trying their hand at this, Marcos has created some screencasts about how to make screencasts that explain how his class has used tools like Windows Journal, Jing, TuxPaint, OneNote, and Camtasia Studio to do their work. Marcos' advice to other teachers? Don't put technology behind glass. "Let them touch the computer," he says. "That's my one-liner. Let them touch the computer. That's how the world changed for me, for all of us. If you give kids a little bit of trust and let them try out some stuff, they're going to come up with fascinating things that will surprise you." Check out this fun video explaining the phenomenon.